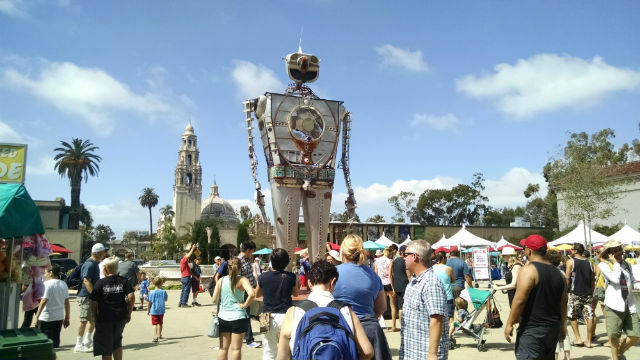 Thousands of tech-obsessed San Diegans descended on Balboa Park Saturday to marvel at technology, craft and art at the bi-national Maker Faire San Diego. Amid whirring 3D printers and flashing LEDs, San Diego Mayor Kevin Faulconer and Tijuana Mayor Jorge Astiazarán jointly opened the two-day event, which is part of the centennial celebration of Balboa Park. The event featured steampunk devotees in costume, miniature warships battling on a makeshift pond, robots and drones of all descriptions, hands-on projects for children, and exotic creations like a flame-shooting robot that towered over the Plaza de Panama. At a kick-off event on Friday, Dale Dougherty, the founder of the nationwide series of Maker Faires, said San Diego has taken the concept to a new level with participation by the mayor’s office, Balboa Park institutions and neighboring Tijuana. “You are really becoming a model maker city,” Dougherty said at the Fleet Science Center. The maker movement is a global, tech-influenced “do-it-yourself community” that has created an innovation ecosystem. City officials see parallels between the movement and San Diego’s growing innovation economy. The event continues from 10 a.m. to 6 p.m. on Sunday. Admission for a single day is $25 for adults and $15 for children.